CASE 1830 UNI-LOADER SERVICE MANUAL. This is the same exact literature that your local Case dealer uses to repair equipment. It was originally printed in 1976. It is complete with 276 pages. The book also comes with several color diagrams. This reprint is actual better easier to use than the original due to the new D-Slant binder which makes the pages lay flat as opposed to the binder that the original comes in. You will not find a better reprint of this manual ANYWHERE! Service Manual Table of Contents. GENERAL Maintenance and Lubrication Torque Chart ENGINE Air Cleaner Engine and Drive Coupling Cooling System FUEL SYSTEM Fuel Pump Fuel Tank and Lines Carburetor and PCV Lines HYDRAULIC SYSTEM Hydraulic Diagram, Maintenance and Trouble Shooting Auxiliary Hydraulic Diagrams. Equipment Pump Loader Control Valve Selector Valves Auxiliary Control Valve Lift and Bucket Cylinders POWER TRAIN Drive Chains, Axles and Cluster Sprockets Wheels and Tires Hydrostatic System Diagrams and Operation Trouble Shooting, Testing and Adjustments Hydrostatic Pump Hydrostatic Motor Hydrostatic Controls BRAKES Brakes ELECTRICAL SYSTEM Wiring Diagram Trouble Shooting Ignition System Battery Starter Alternator MOUNTED EQUIPMENT Loader Loader Auxiliary Hydraulic Installations Roll-over Protection Structure. Need a different manual or disc? The item "Case 1830 Uni-Loader Skid Steer Service Manual Repair Shop Book NEW with Binder" is in sale since Wednesday, March 2, 2016. 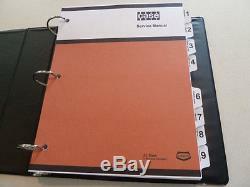 This item is in the category "Business & Industrial\Heavy Equipment Parts & Accs\Manuals & Books". The seller is "loaderservice" and is located in Fort Wayne, Indiana. This item can be shipped worldwide.